For plenty of Americans, recycling is practically second nature. It’s mandated by law in cities such as New York, San Diego, Pittsburgh, and Seattle, where apartment buildings, office spaces, and restaurants must recycle plastics, cans, cardboard, and glass, unless their owners want to face a fine. But even in cities where it’s not required by law, recycling is mainstream. It has turned into a virtue boasted by restaurants like Sweetgreen and fashion brands like Gap, H&M, and Madewell, which recycle clothes in stores and produce clothing lines made of recycled materials. The problem, though, is that while recycling has become trendy, it’s also becoming harder to do. You might not know where all your recycled goods go, but they’re a part of a vast ecosystem that spans the globe and contributes to a $200 billion industry. One country that used to be the biggest importer of recycled materials, especially for the US, is China. But last year, it stopped accepting most foreign recyclables as part of an effort to crack down on the country’s pollution. As a result of this ban, the global recycling system has been crumbling, and plenty of cities in the US are now struggling to figure out what to do with their recycled goods. The University of Georgia has estimated that China’s ban on imported recyclables will leave 111 million metric tons of trash from around the world with nowhere to go by 2030. But we don’t even need to look ahead to the next decade for consequences because they’re already happening. Tons of recycled paper and plastics are piling up across the country, and this problem has only just begun. 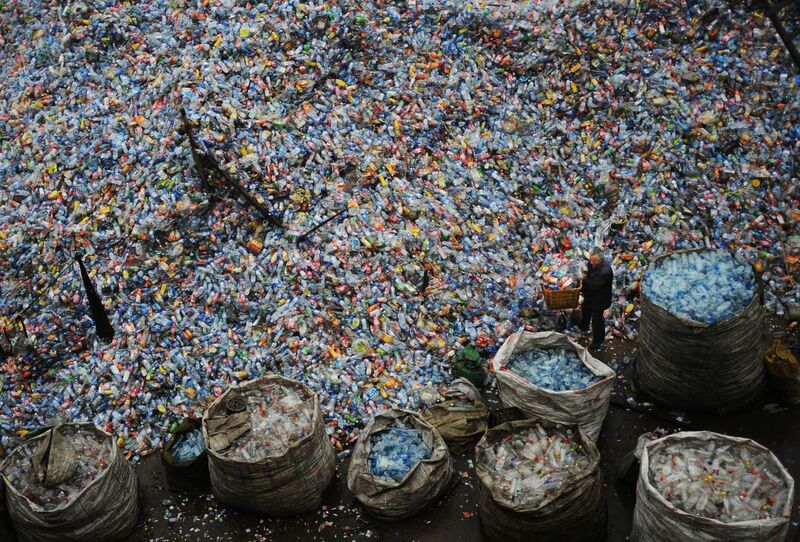 A worker sorts used plastic bottles at a plastics recycling mill in Wuhan of Hubei Province, China, in 2008. Recycling plays a crucial role in minimizing waste and preserving natural resources. Reusing materials like wood, minerals, and water reduces the need for resource cultivation, the United States Environmental Protection Agency notes. Recycling materials also ensures that waste doesn’t go into landfills or incinerators, the EPA adds. Burning trash can be bad for the environment, according to some experts, because toxic emissions are released into the air in the process. Burning plastic, specifically, is known to release highly toxic compounds, called dioxins. Landfills are also problematic; they can leak unsafe liquids into the ground and possibly contaminate nearby water systems. The decomposition of trash in a landfill also creates the greenhouse gas methane, which contributes to climate change. But recycling is also expensive and time-consuming. It requires a tremendous amount of water and energy, in addition to money and effort to build the proper infrastructure. Due to the falling costs of oil prices, virgin plastic is actually cheaper to make than using recycled materials. According to the Environmental Protection Agency, about 66 million tons of materials are recycled in the US, and almost one-third of these materials typically get exported. For the past three decades, almost half of the entire world’s used plastic has been sent to China. In the early ’90s, China saw a monetary opportunity to use its cheap labor. The country began buying recycled plastic, then had small factories in China use the scraps to create inexpensive, plastic exports like shoes, bottles, hoses, and gadgets. The US used to send 4,000 shipping containers of recycled goods to China a day. As of 2016, China was importing 40 million metric tons of recycled goods annually, according to the United Nations. The country’s mass purchasing aided it in becoming a manufacturing hot spot, according to Bloomberg. But the Chinese government has recently has been steering the country away from low-value sectors like waste and is focusing more on higher-earning industries like tech. In the process of becoming the center of everyone else’s trash, the country has also been exposed to mercury, lead, and other dangerous substances contributing to pollution. In 2017, it announced it would no longer be the “world’s garbage dump,” as the Times put it. Since January 2018, China has banned the import of most plastic and papers. It also tightened its restrictions on accepting other materials, like scrap metal. This ban has forced some of the world’s biggest companies to rethink plastic. Corporations including Procter & Gamble, Unilever, Nestlé, and PepsiCo have started using reusable packaging. The European Union plans on placing a tax for plastic bags and packaging as a response to the Chinese ban, and grocery chains like Trader Joe’s are trying to minimize plastic usage. 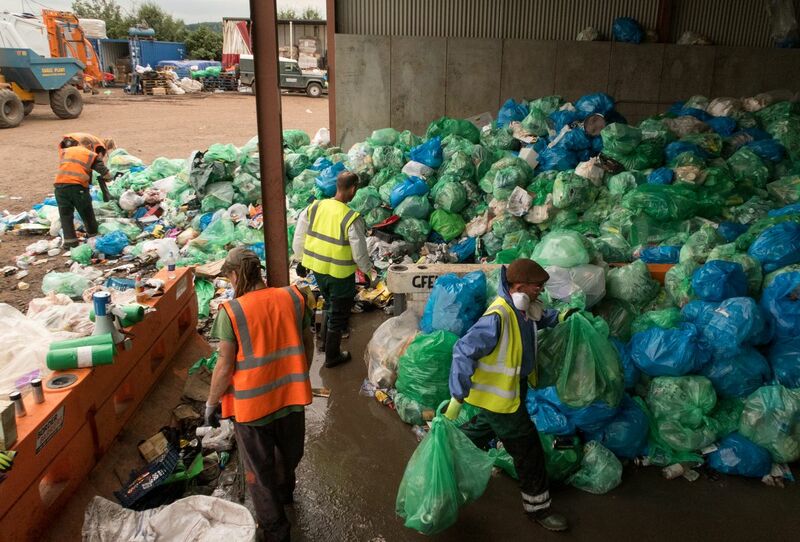 A recycling center in Pilton, near Glastonbury, England, on June 26, 2017. While the ban is pushing American businesses and countries to rethink their environmental footprint, it’s also caused chaos. One waste management executive warned the New York Times last year that many cities will suffer because trash in the US “doesn’t have a place to go,” and cities are now beginning to feel the effects. WasteDive, an industry website that covers waste management, has kept a timeline of how the Chinese recycling ban is affecting the US. It’s reported that every single state in the US has been affected. Some cities are killing curbside recycling pickup; urban recycling centers all across the country are closing as well. The US is not the only country struggling to figure out what it’s going to do with its recyclables. Australia, for example, has resorted to burying its trash, while Canada now sends some trash to landfills or burns it. Ireland is still trying to figure out what it’s going to do, as is Germany. Malaysia, Indonesia, India, and Vietnam still buy recycled plastic in bulk, but no country has yet to take China’s place as a mass recyclables buyer. Some of these countries don’t have the proper infrastructure to handle the volume of recyclables China once processed. And India is trying to follow in China’s footsteps and ban foreign trash, as is Malaysia. Countries are getting sick of buying the West’s recycled trash. Burying and burning garbage are Band-Aids on the larger problem, but the global recycling system must be fixed. NREL Says Don’t Recycle Single Use Plastics — Upcycle!